The luxurious Habtoor Grand Resort Autograph Collection is moments from famous Jumeirah Beach, where you'll find The Walk and a variety of boutiques and restaurants. 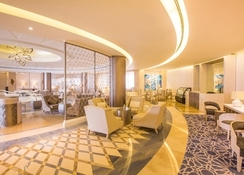 An Autograph Collection by the Marriott Group, this 5-star property's seafront location makes it a popular pick with guests who wish to discover the city, with the glittering Dubai Marina and Mall of Emirates a 10-minute walk away. 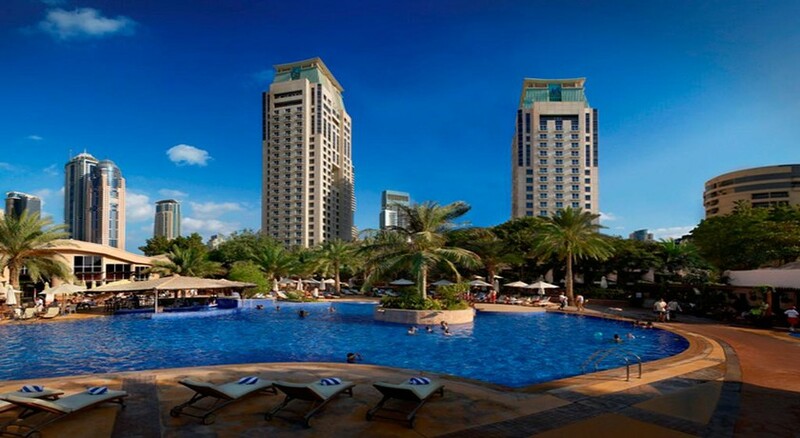 With 446 plush rooms, 14 restaurants and bars, a fitness centre and spa, idyllic landscaped gardens, three swimming pools (suitable for kids and adults) – the Habtoor Grand Resort Autograph Collection is a fantastic accommodation option for families, couples, honeymooners, solo and business travellers. The elegantly designed rooms brim with modern amenities, plus panoramic views of the glittering beach and gardens below. Lounge on Dubai's most exclusive stretch of beach, or get active with watersport activities like snorkelling, diving, cycling golf and water slides. During evening, the hotel hosts music shows and several other live entertainment events to enjoy. At a 30-minute ride from the famous Burj Khalifa and nestled in the heart of the Jumeirah Beach Residence of Dubai, is Habtoor Grand Resort Autograph Collection. Surrounded by shopping complexes, the beach, restaurants, clubs and bars, plus a selection of golf courses - there's plenty of entertainment to be had nearby. The Jumeriah Beach is 80m from the hotel, other attractions include Dubai Marina Mall (1.5km), Burj Al Arab (7km), Emirates Golf Club (7km), Jabel Ali Free Zone (10km), Emirates Mall (10km). Dubai International Airport is the nearest airport located at a distance of 33km. 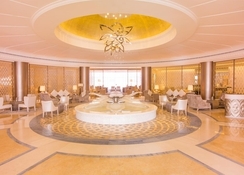 The 446 rooms and suites at Habtoor Grand Resort Autograph Collection ooze luxury and comfort. Guests can choose between Tower, Tower Oceanfront, Tower Family, Club, Club Oceanfront, Club Suite, Family Suite and Ambassador Suite accommodation options at the hotel. A basic set up here offers flat screen TVs, separate living rooms, separate dining area, ergonomic stations, walk-in closet, soundproof windows, sofa bed, en-suite bathroom and a mini bar. Each of the light and airy rooms feature views of the ocean or resort gardens. Luciano’s (Italian cuisine), Al Dhiyafa Grand Kitchen (International cuisine), Bamboo Kitchen (Thai cuisine), Al Basha (Middle Eastern cuisine), The Grand Grill Restaurant and Lounge (Steakhouse), Andreea’s International Fusion Cuisine (International cuisine), Salamar (Cuban cuisine), XL Dubai (Tapas), 4Two (International cuisine), plus a variety of Pool Bars make Habtoor Grand Resort a must-visit for its gastronomic scene alone. 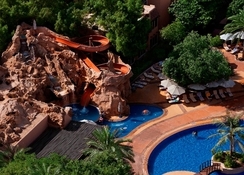 Habtoor Grand Resort Autograph Collection features a private beach and heated swimming pools for kids and adults alike. For fitness lovers on the go, the resort has a fitness centre that offers a variety of programmes. Boating, jet skiing, kayaking, sailing, snorkelling, surfing, water skiing, sauna, squash, tennis and volleyball – this hotel has got it all when it comes to sports and games, too. The children's mini club organises recreational activities including art and craft training. Or guests can unwind at the spa, with a selection of relaxing treatments available. Card Payments are accepted (all cards are accepted). One child under two years stays free of charge in a child's cot/crib. Resort Rooms without balcony are fully renovated. Facing toward the semi - tropical gardens and pool side area, our newly renovated 35sqm resort guest rooms are in close proximity to the pools, beach and restaurants. These bea utifully appointed rooms offer natural mono tones of silk white and chic turquoise decorated amongst light wooden furnishings creating the perfect space for calm and seren relaxation. All rooms have 42 flat-screen television, DVD and High Speed Internet and most of our resort rooms offer large balcony/terraces from which to enjoy garden vistas whilst inside. Please note : This is to inform you that we are extending the dine around options for the half board/ full board bookings to our selection of restaurants ranging from Italian, Lebanese and Thai Cuisines. You can choose from a variety of choices in a set menu that meets every taste. All in addition to the all-day dining buffet restaurant. This is a great hotel. When I arrived, I was given the option to upgrade. I would strongly recommend this option as it works out cheaper. Drinks can be expensive if u drink after hours. The upgrade gives you access to the executive lounge. U have a 2 hour window to drink plus snacks and u get snacks from 3pm. Great views from the lounge, u can see the palm and the Atlantis hotel. Location is good , very close to the beach and the downtown areas. Hotel has great facilities with friendly staff.